Ladies and gentlemen, we are currently living in the summer of Bub. 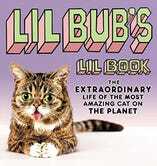 Following her appearance at the Internet Cat Video Festival, Lil Bub's book is now available. You can also watch Vice's documentary, Lil Bub and Friendz, online this week. And in a final punch of slack-jawed cuteness, we now have Lil Bub's Big Show with Whoopi Goldberg, which I hope is just the first installment of an ongoing series.